At 4am one Saturday we loaded five horses at Little Owl Farm near Dover. The horses had been at the farm for several days, having a rest before the journey while their paperwork was completed. The previous afternoon Fred Parker, son of Jackie and John Parker, owners of John Parker International Horse Transport, had cleaned and disinfected the inside of the truck and loaded feed. The final task was to top up the water tank and check the vehicle. The horses were loaded with ease. Parker told us that 'professional' horses such as showjumpers, racehorses and eventers are used to riding in lorries so are more comfortable with being loaded and offloaded than privately owned horses.He made the last check then closed the tail ramp. Dover was the only option for crossing the Channel as livestock isn't allowed on the train and you would have to use a port where there is a vet on duty. At the booking desk we were told that the stabilisers weren't working on the next ferry and we'd have to wait until 07:15am for a crossing. We parked in a lane, looked in on our horses and then headed to the coffee shop. Once on board we ate a welcome breakfast and changed money. Calais was almost empty and we were soon Paris-bound on the A1. While Parker was driving, I watched the CCTV monitor trained on the horses in the rear, A great idea, particularly when your cargo is worth thousands of pounds. As traffic started to turn off for the ring road we came to an abrupt halt. A truck driver was flagging down traffic to warn drivers of an accident ahead. An Actros had ploughed into the back of another truck. pushing it through the concrete barrier and into the ditch. There was severe damage to both vehicles and those involved faced a pile of paperwork. We then came to the queue for the infamous Paris Boulevard Peripherique Interieur and Parker took us through the heavy lunchtime traffic. We kept moving and were soon heading south along the A10 to Bordeaux. At the Shell services on the carriageway just below Paris we pulled in, checked the horses and watered them. Parker and I grabbed a sandwich and cold drink. It was now my turn to drive so we changed tachos and I listened to Parker's advice on driving with horses on board. I was told that you should slow right down on bends and not worry about the drivers behind, who sit on your bumper and are impatient to get by. We pulled out of the parking area and were soon at the peage collecting our ticket. Parker said that although the autoroute was more expensive than running the national roads it would give the horses a better ride. The next few hours passed by on a clear motorway and we pulled over short of Bordeaux to look in on the horses and change drivers. Parker took us through the evening traffic and we made good time to the Dax exit. On the outskirts of Dax there's a racecourse and the stables of Antoine Le Pape, which are managed by his son, Gregory. Here we rested the horses overnight. When the horses had been unloaded and given hay and water and the truck swept out we made the short journey back to the Routiers, Relais de Castets at the Dax exit. At the truck park there's a restaurant that's popular with drivers on the Spanish and Portuguese run. We bought tickets for the 6.50 menu at the bar and went through to the restaurant for a salad, a main course of an 'almost' raw steak mixed with raw egg and french fries, followed by the cheese board. Back at the stables we parked, checked the horses, topped up their water and got our heads down. The first job of the day was to check on the horses and fill the water buckets. Buckets are preferred to drinkers so the driver can tell if a horse is off its water. Fresh bedding was put down and leg protectors were put back on the horses whose owners had asked for them and then all were loaded. We rejoined the A10 and stopped at Bidart services for a snack before dropping down a steep hill to the border. We picked up the signed for Burgos N1 and headed towards the steep climb up to Vitoria. To maximise driving time we stayed on the motorway and didn't stop to water the horses or for lunch until Parker's four and a half hours' driving were up. It was then my turn to take the wheel after lunch and as the kilometres slipped by we started to climb the Sommersiera. I was glad of the air conditioning on the way up to the one kilometre tunnel near the summit, 2129m above sea level, but the 380 Swedish horses had no difficulty at all. It was rush hour when we approached Madrid and evening traffic on the M30 was heavy but we kept moving and took the N4 for Ocana. We picked up the sign for Aranjuez and Parker directed me to our overnight stop, 96km south of Madrid. It was 30c (86f) outside at Aranjuez and we soon worked up a sweat unloading and bedding down the five horses for the night. We returned to the town to eat at La Riberena. a regular haunt of Parker's drivers. By bedtime the temperature had dropped enough to allow us to get a good night's sleep. This was important to me as I was sleeping in the accommodation behind the cab and there wasn't much air up there. After a fix of caffeine we made our way back to the stables to water the five horses and reload them on the truck. Parker made this look easy but he's spent his whole life around horses and knows exactly what he's doing. We picked up the road back to town and followed the sign for the N4 south to Ocana and Bailen. Three and a half hours later we reached El Oasis services area and watered the horses. There was little traffic now apart from the black Volvos of Ralph Davies and the Morocco-bound trucks of John Mann servicing the garment trade. The sign in Arabic for Algeciras directed us along a new toll-free dual carriageway and at Mijas on the Costa Del Sol we phoned the agent and arranged to meet on the costal highway and follow him about 10km into the mountains. The first horses were unloaded and the owner very happy with his English stallion and mare. After tipping there it was a short run back to the the racecourse at Mijas. The huge barn like stables can accommodate up to 300 racehorses and have been designed and built to stay cool inside in the fierce heat. We delivered a racehorse to a regular customer, the trainer Mick Lambert, who along with his son Andrew have become good friends of Parker. Early that afternoon we took a quick run along the Autovia Del Meditarane to Sotogrande where there was a night's stabling at a polo club for a horse and pony that were to be delivered the next day. We bedded them down and the truck was mucked out and washed out using soap and disinfectant because we had a pick up to do before we could deliver our last two horses. At Sotogrande we joined a couple of Parker's friends for a meal and a beer before bedding down for the night in the spare room at their flat. We met the vet and agent in Fuengirola, a 10-minute run down the coast, who had to inspect the truck before allowing us to pick up a horse for return to the UK. Happy with the cleanliness of the truck, they took us to load in the hills above the coast. We stabled this horse at Sotogrande for collection later. We then delivered the two left over from the previous day to their owner, who had moved to Spain to start a B&B up in the mountains. Our short driving day meant we could relax over a cold beer with good company and enjoy a large streak in the Newmarket Restaurant, where the walls are covered with racing memorabilia. Our first collection for the day took us back to the racecourse and we loaded a racehorse from the Lambert stable going home. We went a little north to the smart stables as Benalmadena to load a horse bound for Sweden and then took the now familiar Autovia Del Meditarane and continued along the coast towards Algeciras with Gibraltar on our left, the very top of the rock just showing above the mist. Heading inland we made our way to Jerez on a narrow winding road that was being rebuilt and straightened. Spain has some good toll-free national roads and you can cover great distances without ever seeing a speed camera or traffic jam. We rejoined the autovia and travelled north for an hour to the Sevilla ring road and Parker directed me to stables where we collected our next horse, a big strong three-day eventer. 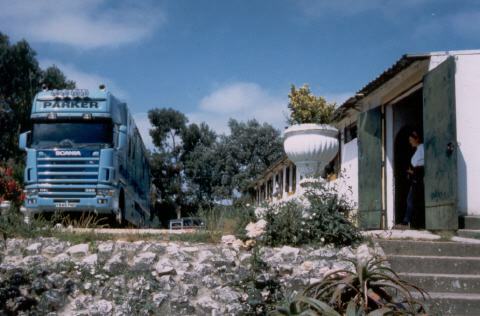 Then it was on to Portugal to collect the rest of our backload. We took the border on a road that ran through olive groves and fields where black bulls grazed. The small town of Rosal De La Frontera was quiet and we entered Portugal without any hitches. Not 10 minutes later we had our only encounter with the police, which ended in smiles all round when the older policeman pointed out to his junior that we had a right-handed drive truck and he should speak to Parker as he was behind the wheel. Leaving them behind we joined the national 10 at Beja and drove to Coruche, east of Lisbon, and stabled the horses for the night giving them hay and water. A 20-minute drive took us to a restaurant for our evening meal and we parked up. We had a civilised 9am start to the day and the first job was filling the twin 500-litre tank with diesel. We had coffee before starting out collections round north Lisbon. Our first was close to the overnight stables and the horses were loaded up with no hassle. We reloaded the three from Spain then on to load our last horse. At the small village of Escusa we had to turn on to a track lined with over hanging trees and bushes that scratched the truck and slowed us to a crawl. Some 3km later we came to the end of the track and the stables. This horse proved to be the most stubborn to walk up the ramp. Even with the air suspension lowered at the back and raised at the front to create easier access the horse didn't like the idea. Once on board, however, it was quiet for the journey to Dax. We drove on the national roads and dropped down to cross the Teja river. We joined the motorway at Guarda for the run to the BP services where we topped up the fuel and watered and fed the horses. Parker had driven the truck for the first shift and I had the pleasure of the night shift across Spain and back to Dax. From Salamanca we were back on dual-carriageway and I set the cruise control to 90km. Keeping an eye on the horses via the on-board camera, I turned the music up and drove in to the night enjoying the empty road. At the Burgos peage we watered the horses and checked their condition before moving on to France. At the border at Irun there were already lots of trucks parked up and it was a bank holiday and they couldn't run on French roads. We were exempt as we had livestock on board and once through the three peages on the A10 it was a short run to La Pape stables as Dax to unload the horses and bed them down - we were having 24 hours off. In the late afternoon the truck was cleaned and the water tank drained and refilled ready for the next leg of the journey. During the course of the day Parker was in contact with the office back home and it was agreed that we'd meet up with the other Parker Scania in Calais. It had a load for Belgium but would take out horses for England and hand over one for us to deliver on our way to Sweden. That evening we went out with Gregory La Pape, manager of the stables, for a seafood platter at a restaurant called Pecherie Duchamp on the coast to the west of Dax. After our meal, washed down with a glass of chilled white wine, we took a look around the marina and headed back to the truck to check on the horses before we turned in. We made an early start and I took the wheel as we rejoined the N10. We made good time up to and round Bordeaux then, sticking to the autoroute, headed north for Paris. Parker made the coffee and turned in as he had completed the first shift. With no hold ups apart from slowing right down at a contraflow to cross over carriageways - mustn't forget the standing passengers! - we made good time. Four and a half hours later we stopped for lunch, watered the horses and checked them over. With the roof vents open and the fans working well the air inside the box remained cool. Parker took the wheel again and we were soon on the outskirts of Paris and in rush hour traffic. Unlike home, we kept on the move and were soon around the city and pulling over in to the first parking area to change drivers again. We continued towards Lille and the turned towards Calais. The A26 had little traffic but we caught up with a Scottish trucks on their way home. Going past the Transmack service area we took the next exit and travelled a short distance on the old road to Oye Plage, a village where the horses were rested overnight. We were expected and the stables were ready so Parker was soon happy about the horses. We made the short journey to the Transmack Elf garage for a bite to eat and to relax over a beer while listening to other drivers moaning about their employer and the job in general. We were up on time and as the other John Parker truck had arrived we all had coffee together. There was no rush for us to be on the move as we were only going to cross to Germany then stable the three horses so that we could deliver them in the morning rather than late at night. Parker had put some name tags on the horses we had transported so we couldn't muddle the loads. With only three horses on we made our way along the corridor (a stretch of motorway the French allow trucks to use on a Sunday to get to Belgium) and Parker fuelled up for the next few days. We called in at the very popular Lokeren Truck Stop on the way to Antwerp and had an early lunch of ham and eggs at 160 Belgian francs (2.50) per plate, filling and good value. Over the road, the Eddie Stobart depot looked busy. We left Lokeren and drove through Antwerp and on to the border at Breda, which is always busy. I used to look forward to driving in Holland because there weren't the restrictions on overtaking there are in Germany, but that has now changed and from 7am to 7pm you're in a long queue of slow moving trucks. We went north past Amersfoort and then east to the border into Germany as Denekamp on the national 213. We planned to rest the horses as Lastrup, a small village that is the base for Guido Klatte, an international horse transporter like John Parker, who is still involved in show jumping. It didn't take long to bed the horses down and it was an early night for us. This was the earliest we had started since leaving home but a 9am delivery had been promised and we wanted to beat the rush hour traffic on the Hamburg ring road and through the Elbe tunnel. An accident on the southbound carriageway slowed us down but the horse's new owner was very happy to see us. Parker drove back to Hamburg and north to the ferry for Rodby in Denmark via Puttgarden. Along the way we watered the two horses and I got back in the hot seat. We booked on to the ferry and were directed straight on to a waiting boat. By the time we had eaten we were being called back to our vehicles and Parker looked in on our four-legged friends, who seemed happy enough. The interior fans had been left running to keep them cool. Driving towards Copenhagen the traffic grew heavier and it started to rain. Like the Dutch, the Danes have introduced long stretches of no overtaking for trucks on the motorway, with the inevitable truck queues it creates. It was a quick run down to the Port of Helsingor and again we were straight on to a waiting ferry, the MF Hamlet, for Sweden. Leaving the ferry in Helsingborg Parker took the wheel and we followed a tree-lined track to a big barn-like building that contained stables and an exercise ring, The owner was very happy to see her stallion and made a big fuss of him. With another clean CMR it was time to be on our way to the final delivery in Koping, north of Stockholm, a further 400km away. We were greeted by another happy client and were quickly on our way again. After feeding and watering the horse I took the wheel and we drove on heading ever north through Jonkoping, home to the Swedish truck show, and into Sweden's aspen forests. The roads were smooth and wide and it was good to drive when there is so little traffic about apart from the 60-tonne drawbars that are operated in this part of the world. We spent the night in a picnic area. On waking I looked in on the horse and topped up the water bucket, then woke Parker and put the coffee machine on. We phoned the customer in Loping and arranged to meet him. He showed us the way out of the town and down a farm track that 2km later led us to a small stable where we unloaded the Andalusian mare that had travelled some 4500km. The owners were pleased that the horse looked so fresh and was in good health but seemed equally impressed with the truck. After coffee we washed the truck out and disinfected it. Driving the empty vehicle to Gothenburg on the west coast of Sweden was relaxing as there were few road works to slow down for. We booked on the Stena Danica for a smooth three-hour crossing to Jutland, one of three land masses that make up Denmark. Another stretch of quiet motorway took us on south towards Haderslev, our morning collection point. We stopped south of Arhus on the E45 at a Shell services area. I woke up half an hour earlier than planned and made the coffee but Parker refused to stir until our agreed time. A short drive brought us to the Haderslev north exit and as we followed the road towards town the stables came up on our right-hand side. A quick turn down a gravel drive took us to a small riding school where our pony was to be loaded. While Parker checked the paperwork was correct I prepared the truck and the horse was led out and straight on board without a fuss. Our next destination was the British Army camp at Bergen. On crossing into Germany at Padborg Parker said it was my turn to drive: Germany is not his favourite country for driving due to all the restrictions. It was also my punishment for waking him early. With a clear run back through the Elbe tunnel and round Hamburg we followed the autobahn south towards Hanover and turned off at Saltau Sud. taking us into the Bergen and the former concentration camp Belsen, which is now a British Army camp. It was strange to see so many UK-registered cars and it felt like we were in a little piece of England. At the riding stables there were teaful goodbyes from the girls who had been riding the pony and it was given leg protectors and a blanket for the journey. 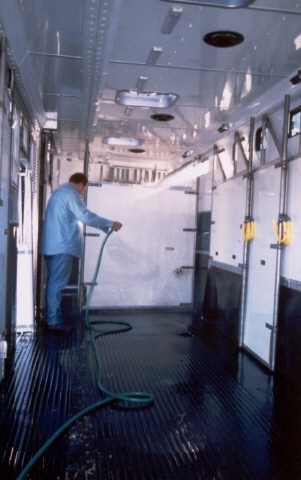 It's the customers choice as to whether the horse wears any protection in transit because the interior walls are padded so there is little danger of injury. We collected our passports from the army camp's main gate and cut across country to Gutersloh to collect a stallion. He took some persuading to walk on but we had to be patient because the lady owner was upset at seeing him go. Parker drove the truck slowly out on to the road and back to the autobahn. We crossed the border at Venlo but couldn't find anywhere to buy the vignette required for driving in the Netherlands. Parker told of being fined late one Saturday night coming from Belgium to meet a flight at Schipol and although he showed his tachograph to the police to prove he'd stopped several times to try to pay the tax, everywhere was closed. They fined him along with two other truck drivers. On this occasion we only had to go a short way to Panningen, a small village where the Bluebell Arabian Stud is used for overnight resting of horses in transit. While Parker prepared the truck I offered water to the horses and then we reloaded them in the front three stalls to make way for the next collection. It was only a short drive to this pick up and the customer was expecting us so we followed him off the road. The mare and gelding were soon loaded and paperwork collected. Our next pick up was at the Jan Tops stables in Valkenswaard and here we loaded a showjumper looking smart in matching blanket and leg protectors. From there it was a short ride to the Belgium border and we enjoyed the best ham and eggs we had all trip. Our last collection was another mare in the small town of Heultje. By now Parker and I had a well worked routine and we were soon on our way across Belgium. With our sixth ferry crossing of the lengthy trip completed we pulled out of Dover and Parker headed for home. The rain came down steadily as we unloaded and bedded down the seven horses at Little Owl Barn. In 13 days we had covered 8500km and carried 22 horses through nine countries. Parker had treated them all, racehorses and pet ponies, with all the same care and professionalism. Seeing owners' reactions at delivery of their pets made all the hard work worthwhile and we were left with a feeling of pride in a job well done.